﻿ The Hitavada - To teach importance of voting, a school HM sings Kirtans! The Hitavada - To teach importance of voting, a school HM sings Kirtans! To teach importance of voting, a school HM sings Kirtans! The biggest celebration of democracy needs participation from each and every citizen so as to strength the voice of the voters and thus, united voice of the nation. However, some do keep themselves away from doing their national duty and participating in the election by casting their vote. Such people need to be woken up from their slumber. Though many governmental and non-governmental organisations are busy spreading awareness about the need to vote, a high school Headmaster has taken the saints’ route to spread across his message and that is through ‘Kirtans’. Sarjerao Rambhau Deshmukh, Headmaster of High School at Bhourad in Akola District moves around villages and makes people aware of the importance of voting in democracy through his kirtans. Deshmukh is a voluntary worker. A true believer in democracy, he has made it his job to make people vote since the last Lok Sabha elections in 2014. Talking to ‘The Hitavada’ about his initiative, the need and the drive to spread awareness and his efforts and its effects, Sarjerao simply puts it, “During the election campaigns launched by political parties, I realised the need to make people aware of the democratic processes and decided to do something independently.” Since then, Deshmukh has worked as a volunteer for Assembly, Corporation and Zilla Parishad elections. Absolutely non-partisan, all Sarjerao wants is to see people’s enthusiasm in democracy manifested through voting. During 2014 elections, he spent Rs 25,000 in the task from his own salary. Riding his motorcycle, Deshmukh visits villages and towns. He has his own portable audio system. 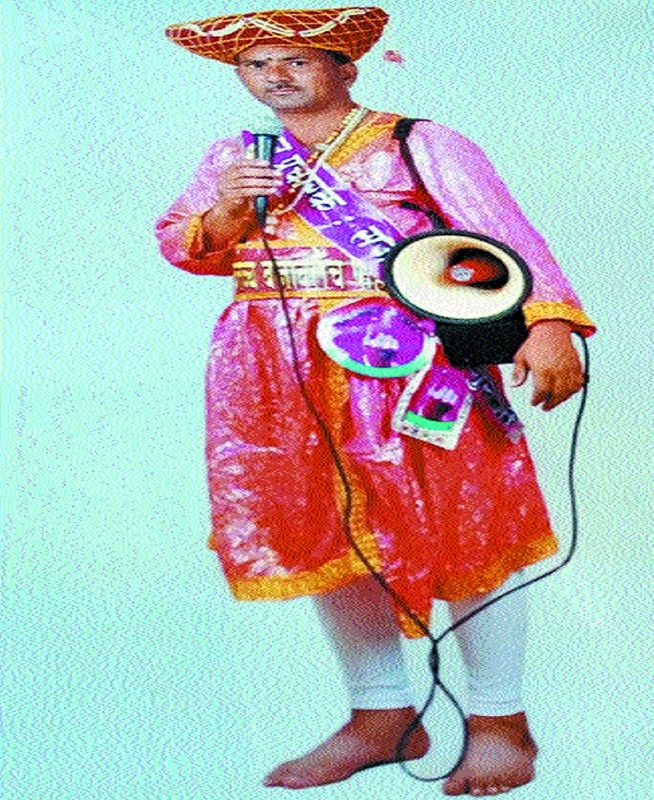 Clad in different costumes - sometimes as a ‘mawla’ and sometimes as a ‘kirtankar’, he collects people at public places and entertains them through ‘kirtans’ and fine oratory. In a simple yet lucid manner, he tries to make people understand importance of voting in an amusing way. He also distributes pamphlets at market places. Not only in the district, Deshmukh has also spread message at India Gate in New Delhi last Assembly elections there. “Often people do not recognise me, some think that I am a party campaigner, some look at me as a ‘Bahurupya’. Once a conductor at Telhara bus depot took objection. I have a permission letter from the Depot Manager, when he came to know this, he apologised,” Deshmukh recalls. “During Akola Municipal Corporation elections, Muslims welcomed a ‘Mawla’ respectfully and appreciated my efforts,” he remembers. Truly he has mobilised every section of the society for participation in voting. Sarjerao was interested in social work since his college days. He had organised health check up camps and plantation programmes in his village Bhourad. After joining teaching as a profession he got more opportunities to engage himself in social activities. Recently, he toured districts of Gondia and Gadchiroli to impart training in the Govt project ‘Jagar Swachchtecha’ for which he has been appointed as a trainer. He has also found a ‘Warkari, Gadkari Kirtankar Mahasangh’ for implementing social reforms through the tradition of ‘kirtans’. “My share is very little in the entire process, yet I wish to contribute to the best of my abilities,” he humbly says. In this election too, Deshmukh is committed to make efforts to increase voting turnout. He has asked for permission from the District Electoral Officer to join the SVEEP programme of voters’ awareness. He plans to take two school students’ help to appeal to parents. Deshmukh receives support from the administration in his drive which is above politics and a national campaign. He has been guided by Prakash Andhare, Assistant Nodal Officer for SVEEP in his awareness campaign. He acknowledges co-operation of the government agencies to let him continue his drive for democracy.